This 3-Tier Planter Stand in Teak Wood for Outdoor or Indoor Use would be a great addition to your home. It is made of teak, so it is extremely durable and resistant. It simple fit for your retro or modern decoration. It helps you to save space and decorate of your room or garden. 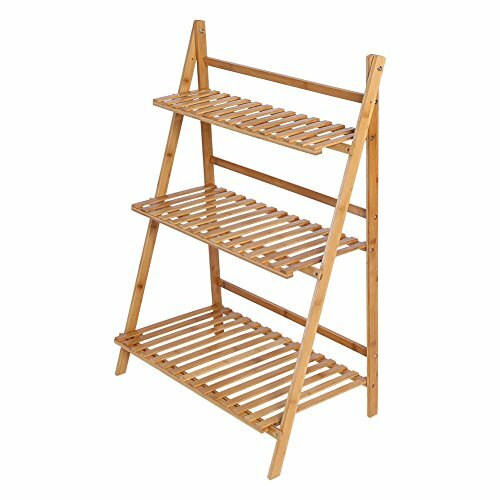 3 Tier plant stand in teak wood for outdoor or indoor use Great for displaying potted plants, shoes, books, candles, picture frames, glassware and more Material: Bamboo Foldable Assembly require Overall Dimensions: 27.5"W x 38"H x 15"D Package included:1 pc 3 Tier plant stand (other accessories demo in the picture is not included) Notice: Please allow 1-3mm error due to manual measurement and make sure you do not mind before ordering. Please understand that colors may exist chromatic aberration as the different placement of pictures. It is made of teak, so it is extremely durable and resistant. It simple fit for your retro or modern decoration. It helps you to save space and decorate of your room or garden.